How Did All This Stuff Get in My Fridge? 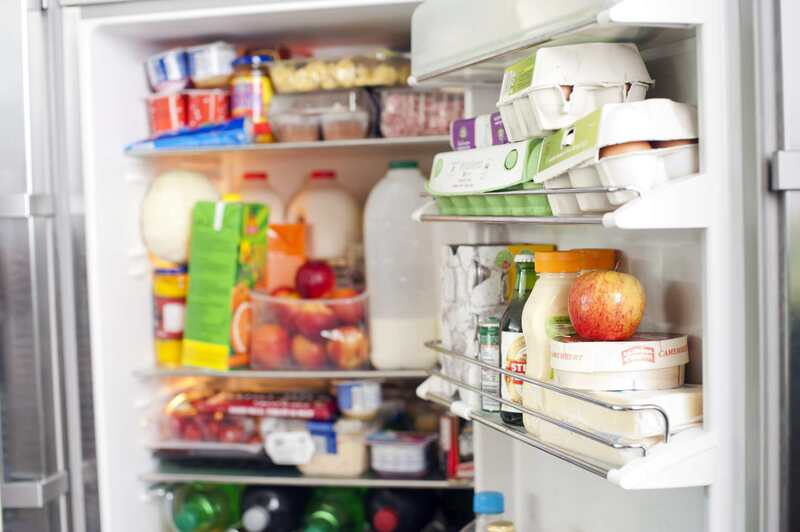 If you return home from the grocery store and reflexively place everything you bought in your refrigerator, you may be surprised to learn that some of those items don't belong there. Generally, items that are meant to be spread or poured do not require refrigeration, nor do many fruits, vegetables, or fats like butter. But some foods are harder to classify. Ketchup is one of the most popular condiments in the nation, served with everything from scrambled eggs and steak to pizza, french fries, onion rings, and chicken tenders. We tend to store opened bottles of ketchup in the refrigerator. Yet in many eateries, the ketchup bottle is left out on tables, alongside the salt, pepper, and sugar—and this is acceptable because of ketchup's acidity. Acidity (as measured on the pH scale) is one of the six factors that contribute to the growth of bacteria in food. Most harmful bacteria require a neutral to a mildly acidic environment, with a pH level of 4.5 or higher. Because of its acidic ingredients (tomatoes and vinegar), ketchup has a pH between 3.5–3.9. Conclusion: Keep your ketchup in the cupboard, not the fridge. Like ketchup, we tend to refrigerate open bottles of syrup to keep them fresh but it's unnecessary. Because of the moisture content of syrup, it is immune to the bacteria growth. In the culinary world, the moisture content of food (i.e., how much water it contains) is described using a measurement called "water activity," which is notated aw. To support the growth of bacteria, food needs to have a moisture content that corresponds with an aw value of .90 or higher. Raw meat, for example, has an aw of 0.95. Syrup, on the other hand, has an aw of around 0.80, which means bacteria won't grow in it. Syrup can sometimes get moldy, but mold can grow in the refrigerator, too. If you see mold, just throw it out. Conclusion: Keep your syrup in the cupboard, not the fridge. Peanut butter should be spreadable; kept in the fridge it can harden like cement. But while high protein foods like meat, eggs, milk, and peanut butter are targets for the bacteria that can make us sick (protein is another of the six factors that contribute to bacteria growth in food), peanut butter has a low aw (around 0.70, even lower than syrup). Bacteria aren't going to grow in it. Peanut butter can sometimes go rancid—particularly the natural kinds— especially when exposed to heat, light, and oxygen. But store it in the cupboard, far away from the stove, with the lid on tight and the cupboard doors shut, and it will be safe. Conclusion: Keep your peanut butter in the cupboard, not the fridge. Jellies and jams do not need to go in the fridge because they have a water activity of around 0.80, and their pH is usually around 3. So, not enough moisture to support bacteria, and too acidic for them as well. Conclusion: Keep your jams and jellies wherever you want to. Barbecue sauce has the same primary ingredients as ketchup: tomato, vinegar, sugar, and salt. The median pH value for commercial barbecue sauce is 3.92, and it ranges from 3.47–4.15. Since food with a pH value lower than 4.5 is too acidic to support the growth of spoilage bacteria, it's safe to store barbecue sauce at room temperature, in your cupboard or pantry. Conclusion: Keep your BBQ sauce anywhere you want. Butter is mostly fat and contains very little protein—not enough to support the growth of bacteria. Salted butter has an even longer shelf life. But unless you're following a recipe for pie dough, cookies or scones that calls for cold butter, there is no need to refrigerate it. Like peanut butter, butter can go rancid if exposed to oxygen, light, and heat. But as long as you keep it in an opaque butter dish, and use it in a reasonable amount of time, it's perfectly OK to store butter on the kitchen counter. Conclusion: Keep your butter in a butter dish on the counter, not in the fridge. Refrigerating potatoes causes the starches to turn into sugars, affecting not only the flavor but also the texture. The ideal temperature for storing potatoes is 55 to 60 F, but if you use them within a week, room temperature is fine. More important is keeping them out of light, such as in a paper bag, so they don't develop a green-colored toxin called solanine. Try to keep them away from onions, which emit moisture that can cause potatoes to sprout. Conclusion: Keep potatoes in a cool, dark place, away from onions. Refrigerated, honey will harden into an amber-like consistency that makes it impossible to squeeze out of a bottle. Moreover, refrigerating honey is totally unnecessary. Archaeologists in Egypt have found 3,000-year-old pots of honey that is unspoiled (thanks to acidity, hydrogen peroxide, and absence of water), making it the most shelf-stable food in the history of the planet. Conclusion: Keep honey in the cupboard. Oils go rancid when they're exposed to oxygen, light and heat. So while you shouldn't store cooking oils near an oven, refrigerating them isn't necessary. In some cases, they will cloud or even harden in the fridge. Conclusion: Keep cooking oils tightly sealed in a cool dark cupboard and use them within 3 months. Exceptions: Nut oils like walnut and hazelnut oils are particularly prone to rancidity, so refrigerating them is not a bad idea. Bread and other baked goods (like cakes and cookies) are not prone to bacterial spoilage but they do go stale. It happens to all baked goods, but the process is much more rapid in the refrigerator as the cold accelerates the re-crystallization of the starches. Freezing, on the other hand, halts the process. Conclusion: Store bread and baked goods in airtight bags or containers at room temperature if you'll use them within a week, or in the freezer for longer storage. Chilling does two things to tomatoes: It halts the enzymatic process that produces the chemical compounds that give a tomato its flavor, and it damages the cell walls of the tomato, giving it a grainy, mealy texture. Conclusion: Store unripe tomatoes at room temperature. As for ripe ones, don't store them, eat them! While bar chocolate should not get too warm, it's fine to store it between 65 and 70 F, provided you keep it away from direct sunlight and tightly sealed to protect it from moisture. The refrigerator causes condensation to form on the surface of the chocolate, which in turn will cause the sugar to bloom, producing white blotchy patches on the surface. Conclusion: Store bar chocolate at room temperature, tightly sealed. Onions keep best in a cool (55 to 60 F), dark place with plenty of ventilation, which is why they come in a mesh sack rather than a plastic bag. But provided you use them within a week, room temperature is fine. The cold damages their cell structure (like tomatoes), and the humidity of the fridge can encourage mold growth. Conclusion: Store uncut onions at room temperature for up to a week. Garlic is a member of the same family as onions and responds to cold in much the same way: the flesh can become mushy, and mold can grow beneath the papery skin. They prefer cool, dry places with good ventilation (i.e., not in a plastic bag). Conclusion: Store garlic bulbs at room temperature for up to a week.